Sarid was one of Zebulun cities, and located in the Jezreel valley. Near the Tel (in Arabic, Shadud, which preserved the name) is the Kibbutz by the same name, Sarid. Joshua 19: 10: "And the third lot came up for the children of Zebulun according to their families; and the border of their inheritance was unto Sarid." Sarid is a Biblical city in the Jezreel valley. It was mentioned in the bible as belonging to the area of Zebulun. Today its ruins are located near Kibbutz Sarid. 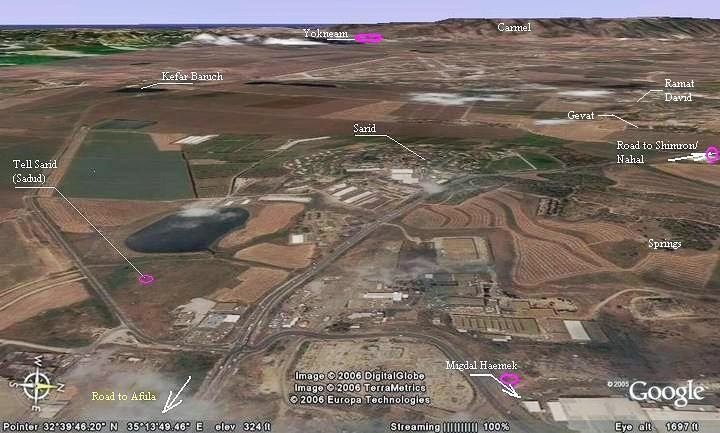 The Tel (Biblical mound) can be seen while driving from Nahalal towards Afula, near the junction of Migdal Haemek and Kefar Baruch. The name of the Tell in Arabic is "Sadud" or "Shadud", which preserved the ancient name and is one of the keys for the site's identification. The aerial map of the area shows the site from the east side, indicating the points of interest in the area. Pointing on purple points will automatically scroll to the relevant photo, text or web page. The site of Tell Sarid was inhabited for 2000 years: starting from the Bronze age, and continued to be in use throughout the Israelite/Iron Age, up to the Hellenistic period (2-3 C BC). The city was strategically located near the ancient road that was adjacent to the site, which connected Shimron to Mount Tabor, Afula, Megiddo and other east Galilee cities. Egypt conquered Canaan in the 16th Century BC, during their struggle against the Hyksos invasion to Egypt. In the second half of the 15th C BC a coalition of Canaanite cities, headed by Megiddo, mutinied against the Egyptian rule. The Egyptians crushed this attempt in the famous battle near Megiddo (1468 BC), which resulted in the Egyptian re-conquest of Canaan for another 350 years. A total of 119 cities were listed on tablets in the Egyptian temples as the conquered and enslaved cities. The city of Sarid is not explicitly listed as one of the cities that were conquered by Egyptian Pharaoh Thutmose III . The Canaanite cities continued to try to disengage from the Egyptian rule. 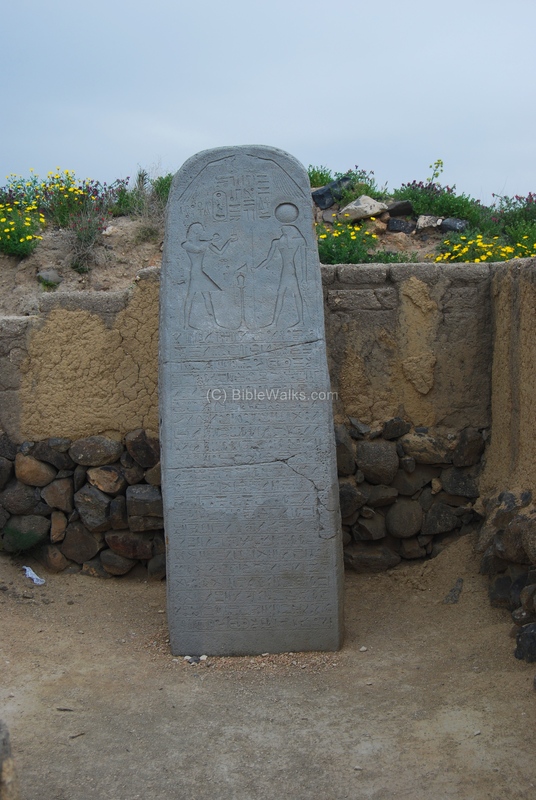 An Egyptian basalt stele was found in 1928 on Tel Beit She'an (see photo on right). It commemorates another Egyptian military victory during the reign of Pharaoh Seti I (~1294-1279 BC) who quelled the rebellion. At that time a coalition of several rebelling cities attempted to seize the headquarters in Beit She'an, and were crushed by the Egyptians. In 2014 a salvage excavation unearthed a clay coffin dated to the 13th Century. 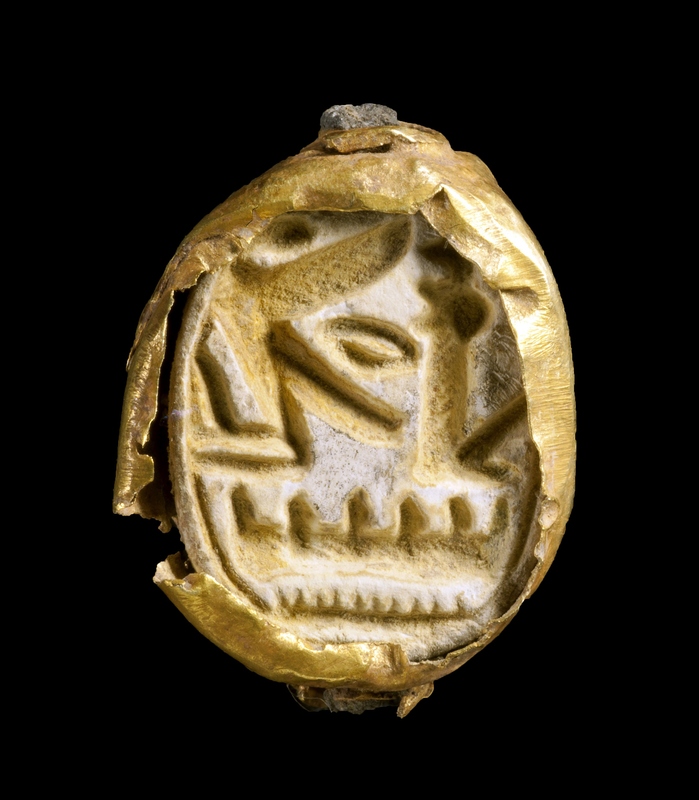 Inside was a gold ring, bearing the name of the Egyptian Pharaoh Seti I (~1294-1279 BC), son of Ramses I and father of Ramses II (commonly identified as the Pharaoh of the Exodus). In the Roman times this site was already deserted, but the Roman road passed nearby. This road connected Sepphoris to Legio (Megiddo), and from there to the south of Israel and Egypt. Since Jesus traveled several times from Nazareth to Judea and Jerusalem and back, he must have passed this site by this road. In 1868 a German Christian sect tried to settle near the Tell, near the ruins of Khirbet Huneifis (Akhnifs, or Ikhneifis). After a short time they encountered hardships, became sick and died from Malaria, and decided to evacuate the site to other places. The area around Tell Sarid was examined in the PEF survey (1866-1877) by Wilson, Conder and Kitchener. It appears at the top-left side of a section of sheet 8, and is named "Tell Shadud". "Tell Shadud (Mi) —A good-sized artificial mound, with fine springs beneath on the south". A kibbutz by the same name, Sarid, was established in 1926 in the area west to the Tel. This aerial view of Tel Sarid was captured in September 2015 from a drone on the south west side of the mound. The south industrial area of Migdal Haemek is on the left background, to the north of the junction and the gas station. In the center of the far background is Mt Precipice (Nazareth) and the round hill of Mt Tabor. On the right is the valley of Yizreel. This is the view from the south, close to the road from Migdal Haemek to Kefar Baruch. A view from the valley below the Tell, a small creek that used to flow water from the springs nearby (Ein Haklil) into Lake Baruch and Kishon river. It was one of the sources of water for the Tell. Another source of water was Sadud springs, on the south-eastern side of the hill (across the road). In April 2014 the IAA announced the discovery of rare artifacts during a salvage excavation at the foot of Tel Sarid (Tell Shadud). The excavation was conducted prior to an installation of a gas pipe to the nearby Industrial park of Ramat Gabriel, Migdal Ha-Emek. The photos of this section are the courtesy of the IAA - Israel Antiquities Authority. The excavation was directed by Dr. Edwin van den Brink, Dan Kirzner and Dr. Ron Be’eri. A 3,300 year old coffin was one of the exciting findings. 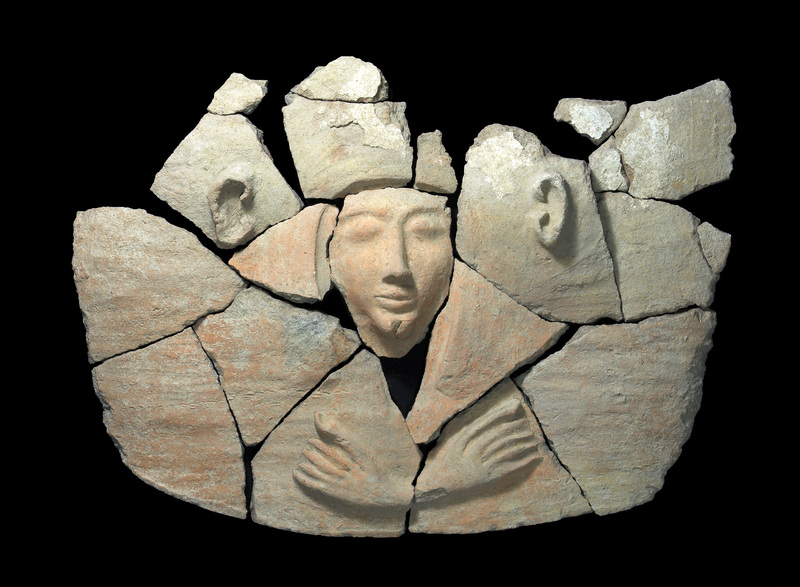 This clay cylindrical coffin was probably the burial place of a wealthy Canaanite, possibly an official of the Egyptian army. The burial site is dated to the 14th or 13th Century BC (Late Bronze age). A skeleton of an adult was found inside the coffin. A detail of the head of the coffin, with a cover bearing an image, is seen below. This burial method is termed "anthropoid coffin", which is an Egyptian burial practice commonly used in the 14th to the 10th Century BC. Inside the coffin was a gold ring, bearing the name of the Egyptian Pharaoh Seti I (~1294-1279 BC), son of Ramses I and father of Ramses II (commonly identified as the Pharaoh of the Exodus). The coffin was surrounded by a variety of pottery, a bronze bowl and dagger (seen below), to be used in the afterlife of the dead. Additional graves of two men and two women were found near the coffin. This discovery attests to the Egyptian control of the area during the Late bronze Age. "And the third lot came up for the children of Zebulun according to their families; and the border of their inheritance was unto Sarid. And their border went up westward, even to Maralah, and reached to Dabbesheth; and it reached to the brook that is before Jokneam. And it turned from Sarid eastward toward the sunrising unto the border of Chisloth-tabor; ...". In this text the name "Yessded", breaking the clods of the ground, which may be the source of the name (see also below in the Etymology).
" Doth the plowman plow all day to sow? doth he open and break the clods of his ground?" "And Ephraim is as an heifer that is taught, and loveth to tread out the corn; but I passed over upon her fair neck: I will make Ephraim to ride; Judah shall plow, and Jacob shall break his clods". * Sarid - in Hebrew: remnant. However, the common interpretation for the source of the name is "Sadid". The verb is Sidud, which means in Hebrew: crumbling, loosening (of soil), as a preparation for seeding the field. There are several Biblical references to the use of this word - see above.